Successful organizations strive for excellence in their performance and operations. In order to do that, they constantly update their processes and find out areas of improvement by following new studies, experiments, and professional advices. In this article, we are sharing a recently published infographic by McKinsey & Company, which highlights key components of successful digital marketing. Owing to the credibility of the publisher and value to marketers, we are reposting it with due credit to McKinsey. 5 components of successful digital marketing are so important that companies that master them can easily outperform their competition. 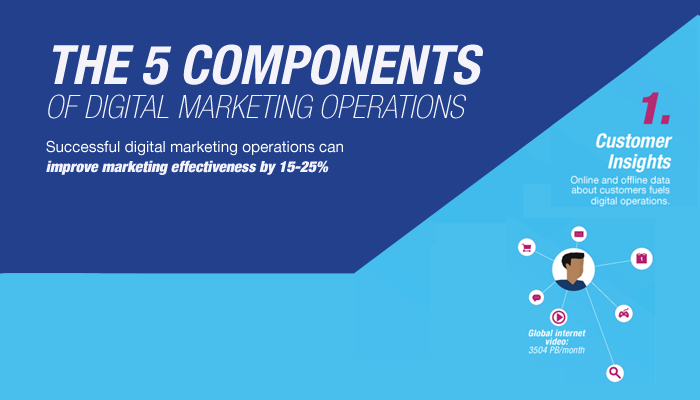 Here, we are giving a brief introduction of the same components of digital marketing operations followed by the infographic. The first component of digital marketing is ‘analytics’ or online/offline data about the customers. It comes from internal studies, web analytics, social media monitoring, and industry publications. You can see some statistical examples in the infographic, like: 48,000 Apple Store downloads per minute. Once the data has been gathered then it is translated into products, contents and offerings. At this stage, marketer builds a content supply chain and ensures that the right content goes to the right prospect on the right time. It’s vital element as many companies claim knowing what needs to be build, produced or offered; however, reality shows a big gap between customer expectations and company offerings. This leads to many missed opportunities. Analytics and performance measurement metrics are very important. They help understanding what makes a customer purchase the product, what they liked and what needs to be improved. McKinsey & Company projects that a company with reliable customer analytics system are 3x more likely to generate above average growth. We’ve explained key metrics to measure your email marketing success in a previous post. Read it here. Digital marketing is backed by technological solutions and tools. All of the marketing operations are supported by technology to enable personalization at scale, automated customer experience and workflow efficiency. From email blasts to lead nurturing, social media management to content publishing; everything has a tool to be used. Generating real benefit from technology enabled marketing depends upon the level of workforce skills and its ability to use the tool effectively. Governance and compliance framework ensures that envisaged standard operating procedure is being followed properly and the resources are well-trained for the job. We can also call this a kind of performance audit. Here’s the infographic. You can download it in PDF format from the link given at the bottom. Thank you.